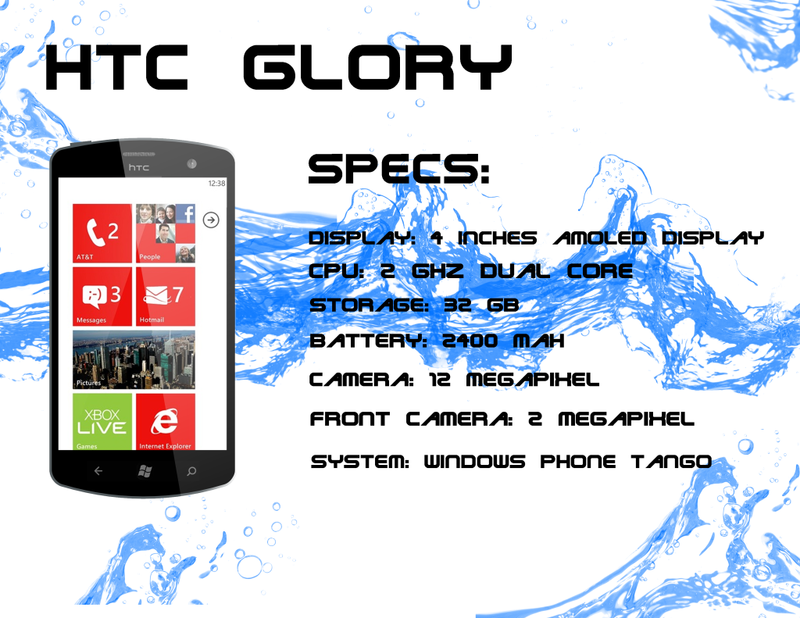 Wp7__fan, the same guy who created this Nokia concept with Windows phone now sent us his new design, that involves a HTC Windows Phone handset. This model is called HTC Glory and to me it looks more like the LG Optimus 7, as far as looks go. It has a 4 inch display based on AMOLED technology, probably with the usual 800 x 480 pixel resolution. HTC Glory features a 2GHz dual core processor, 32GB of storage, a 2400 mAh battery and a 12 megapixel camera. There’s also 2 megapixel camera at the front and the operating system here is Windows Phone Tango. No one knows exactly what Tango will bring, but I’ve heard that it comes with support for LTE, NFC, different form factors for phones (BlackBerry-like with combos of touch and QWERTY) and support for front camera. The next OS, Windows Phone Apollo will be the big one, supporting dual core processors and 720p resolutions.